The nearly bankrupt state declared “a state of public calamity” as it faces security, health and education crises. The 2016 Olympics were supposed to be Rio de Janeiro’s crowning moment, another coming-out party for a city known as much for its chaos as for its beauty. But with less than two months to go before the games, Rio faces a deepening economic crisis and infrastructure problems. The nearly bankrupt state is also struggling with a public health issue and crime – as well as paying its bills. The decree also gives the government the power to make “exceptional measures” to ensure the Olympic Games. Moreira Franco, executive secretary of the federal government’s investment partnership program, told reporters Monday that the federal government should give Rio financial assistance to avoid embarrassment during the Olympics. Meanwhile, the expansion of Line 4 of the subway – which will connect the site of the Olympic Park and Village at Barra da Tijuca to Ipanema beach – has not been completed, and may not make the Aug. 5 deadline. It’s also a disappointment for commuters: full operations have been bumped to 2018. Intended to transport hundreds of thousands of athletes and spectators during the games, it may not even be finished in time for testing before the opening ceremony. "We want to know whether shortening the time to test the subway puts the safety of the passengers at risk," Jonas Lopes, president of Rio de Janeiro state's court of auditors, told the AP. Testing could prove important given recent problems with Rio infrastructure. In April, a section of a months-old bike path collapsed, killing two. This month, a power outage hit a new light rail system a day after it opened, and a new highway near Barra da Tijuca already has potholes and cracks after its inauguration. Without the new line, visitors could face major delays on the congested roadways. The government says it has contingency plans to avoid traffic jams, including dedicated lanes. Rio is also grappling with security problems. Murders rose 15 percent in the first four months of this year compared to 2015, and street robberies rose by nearly 25 percent. “Without any doubt, the situation got worse in the last four months,” said Rio state security secretary Jose Beltrame in a Washington Post interview. The state’s “pacification program” to install a permanent police presence in the city’s favelas has deteriorated, with gun battles a frequent occurrence in these communities. And the violence has also spilled out into other parts of the city. Since the beginning of the year, there have been at least three mass muggings and 10 shoot-outs on the city’s highways. This past weekend, armed gunmen stormed a Rio hospital to free a suspected drug trafficker, leading to a shoot-out with police that killed one and injured two. About 85,000 soldiers and police are slated to provide security during the Olympics. 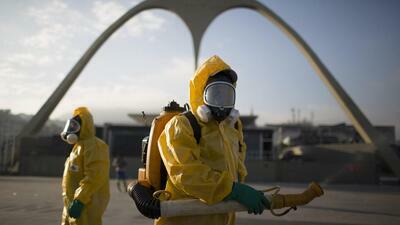 To boot, Rio state is dealing with a public health crisis. In December, the government declared a state of emergency; public hospitals have reduced services or closed their doors altogether with patients facing long delays. Jorge Darze, president of Rio’s doctors’ union, told Folha de São Paulo that at one Rio university hospital, surgeries have been suspended as of today. “The hospital’s cleaning staff haven’t been paid in months, and the facilities are dirty and are in no state for surgeries,” he said. Like in other Brazilian states, Rio is battling the Zika virus, which has caused concern ahead of the Olympics as it has spread across Brazil and Latin America. Rio state has identified 66 cases of microcephaly – a birth defect linked to the virus - as of June 4, according to the health ministry. The state’s public school system is also in dire straits. With their salaries delayed, the state’s teachers have been on strike since March. More than 70 schools have been “occupied” by students protesting overcrowding, dilapidated infrastructure, and staff layoffs.